On Tuesday, Whole Foods announced it would stop offering plastic grocery bags, giving customers instead a choice between recycled paper or re-usable bags. I am not sure I am completely satisfied with the recycled paper portion of their solution, but still, it’s progress, and one piece of news that will make the folks at Algalita happy. I have written extensively before about the important work done by Algalita researchers. We left Hilo last night, January 20, at dusk, just a few hours shy of nightfall. A full moon cast a bright, silver sheen over the gently rolling swells, making the first night watch a stunningly beautiful spectacle. Our first planned sampling spot lay just off the southernmost point in the United States; Kamilo Beach. Kamilo beach is also the most polluted beach in the United States, a considerably less glamorous yet no less interesting selling point for this crew. Just a few days before our departure, we’d braved the 2-hour, treacherous drive out to Kamilo to see for ourselves. What we saw there must be seen to be believed. A picturesque, volcanic coastline, far from any visible development, clear blue waters and spectacular beaches – entirely covered in plastic debris. (Photos of Kamilo here. Can you find it on the map using the coordinates on the GPS in one of the pictures? )It is precisely spots like this that exemplify the need for a better understanding of how far reaching the marine debris issue really is. And a powerful visual reminder as to why were embarking on this month long journey…..
Somewhere around midnight, we witnessed an active lava flow erupting from the slopes of Mauna Loa, rousted from our rocky slumber by the Captain. The view was well worth the wakeup call – a fiery red glow emanating from the coastline. By sunrise, the wind was blowing 35 knots, too powerful to begin sampling, so we continued on, taking a highly productive detour to try our luck at scouting out some sashimi. As the photo here suggests, mission accomplished: Jeff with the first of 6 small Ahi, known as Shibi, filleted in less than 5 minutes. And consumed tonight for dinner. Satisfied with our haul, we began fishing for plastic. We out set the Manta Trawl to collect samples off the leeward side of the Island, an area one would expect to find little in the way of plastic debris due to the wind currents. We found however clear evidence of small plastic particles, along with a host of fish eggs and Copepods. There is truly no “pristine’…. Later in the afternoon, we prepped for our first dive, a chance to test out our equipment and refresh our scuba skills during calm seas. The area was relatively barren of life, save for countless Jellies and Salps of various shapes and sizes. Joel, Jeff, and Marcus practiced working the underwater video equipment, Anna had a much needed “brush up” dive, and Charles spotted the most interesting creature of us all, a large ctenophore. We’re now on track again, westward bound. In about 4 days, we should reach one of our main study areas, an area yet to be sampled for plastic debris. 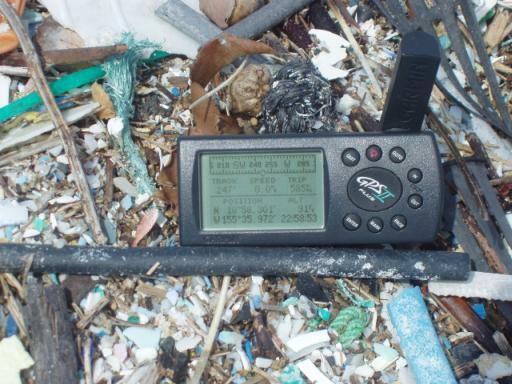 Though just one day into our journey, the reality of finding trash in such remote areas of the ocean underscores the message: There simply is no “away” in a throwaway culture.Aloha from the Captain and Crew of ORV Alguita. In line at the local grocery store. ‘Plastic?’. The guy ahead of me doesn’t think for a second. ‘Yes’, and gets his two or three items quickly bagged, and leaves. My turn. The lady asks, ‘Do you want a plastic bag?’. I am buying a half gallon of milk, that’s it. That’s when I had to tell her. The ‘Circle of plastics‘ thing. ‘People are so unaware’, she tells me. I leave her thinking. and my green conscience would not let me. I let the people behind me go ahead, after apologizing profusely. And I retrieved the green bags from my car. That will be two less plastic bags for the fishes and the birds. ‘Drastic Plastic‘, the article I wrote for Environmental Graffiti this week, has made a strong impression on me. Now, I cannot throw away a plastic bag without thinking about all the birds and fishes dying of a slow death because of me. Yesterday’s trip to Whole Foods gave me plenty of opportunities to cringe. Fruit and vegetable section: plastic bags. Bulk section: plastic bags. Fish and seafood section: plastic bags. Checkout counter: plastic bags. I go home, and Prad tells me the city does not recycle plastic bags. Now I try to minimize the problem by putting the fruit and vegetables directly into my green bag (when I remember to bring it). That’s not enough. There is still the issue of the bulk and the seafood. I am thinking of bringing empty yogurt containers, next time. At least, I will have done my share. Still. it does not solve the bigger problem. I asked the Customer Service man about Whole Foods intentions. They are ‘thinking’ about all these issues. When will they do something about it? After you read it, you will never want to use plastic bags ever again . . .